We have come to the end of our wonderful trip after 189 days or 27 weeks and 32,000km. The trip cost roughly $220 per day with the major expenses being the combination of fuel and car (service, new tyres, windscreen, excess etc). We did however spend more on food than on fuel, so it is interesting to note that it costs more to fuel 5 bodies than 1 landcruiser. Coming in third on the expenses list was entertainment, but it did include 2 helicopter flights and all our entrance fees and activities....but after all you go all that way and don't want to miss out on something.Keeping this site has been fun and hopefully those who have visited have enjoyed our travels also.The experience was educational for all of us and the kids grew both physically and mentally. They became more mature, responsible and empathetic (though unfortunately they do still fight, but not as much!). However the best part of our trip of a lifetime was the time spent together as a family from the mundane daily tent set up through to the magical swimming with sea lions, we spent every moment together. Our diaries will prompt our treasured memories and we hope the kids remember it forever. We were blessed with perfect health, lovely weather and some of the best sites Australia has to offer. 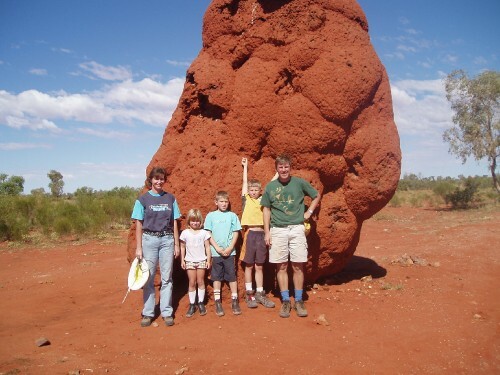 We did leave some to do on future trips as Australia is just too big to do it all! We are converted 4x4 drivers and Stephen is planning the Cape York adventure for next time!! In the meantime we are living our next adventure as expatriates in Macau, China.